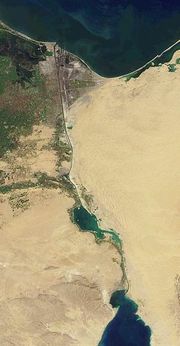 The Suez Canal (Arabic: قناة السويس‎, translit: Qanā al-Suways, French: Le Canal de Suez), west of the Sinai Peninsula, is a 163-km-long (101 miles) and, at its narrowest point, 300-m-wide (984 ft) maritime canal in Egypt between Port Said (Būr Sa'īd) on the Mediterranean Sea, and Suez (al-Suways) on the Red Sea. The canal allows two-way north to south water transport between Europe and Asia without circumnavigation of Africa. Before the opening of the canal in 1869, goods were sometimes transported by being offloaded from ships and carried overland between the Mediterranean and the Red Sea. 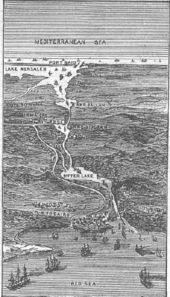 Perhaps as early as the 12th Dynasty, Pharaoh Senusret III ( 1878 BC - 1839 BC) may have had a west-east canal dug through the Wadi Tumilat, joining the Nile with the Red Sea, for direct trade with Punt, and thus allowing trade indirectly between the Red Sea and Mediterranean. Evidence indicates its existence at least by the 13th century BC during the time of Ramesses II (see , , , , ). It later fell into disrepair, and according to the Histories of the Greek historian Herodotus, re-excavation was undertaken about 600 BC by Necho II; though Necho II never completed his project. Saith King Darius: I am a Persian. Setting out from Persia, I conquered Egypt. I ordered this canal dug from the river called the Nile that flows in Egypt, to the sea that begins in Persia. When the canal had been dug as I ordered, ships went from Egypt through this canal to Persia, even as I intended. It was again restored by Ptolemy II about 250 BC. Over the next 1000 years it was successively modified, destroyed and rebuilt, until finally being put out of commission in the eighth century by the Abbasid Caliph al-Mansur. More than a thousand years elapsed before the next attempt was made to dig a canal. At the end of the 18th century, Napoleon Bonaparte, while in Egypt, contemplated the construction of a canal to join the Mediterranean and Red Seas. His project was abandoned, however, after a first survey erroneously concluded that the waters of the Red Sea were 10 meters higher than those of the Mediterranean, making a giant locks based canal much too expensive and very long to construct. The Napoleonic survey commission's error came from fragmented readings mostly done during wartime, which therefore resulted in imprecise calculations. In 1854 and 1856 Ferdinand de Lesseps obtained a concession from Said Pasha, the viceroy of Egypt. (De Lesseps had come to know Said as a French diplomat in the 1830s and had a very friendly relationship with him, which he used to his advantage in getting the concession.) Said Pasha authorized the creation of a company for the purpose of constructing a maritime canal open to ships of all nations according to plans created by Austrian engineer Alois Negrelli. By way of a lease of the relevant land, the company was to operate the canal for 99 years from its opening to navigation. The Suez Canal Company ( Compagnie Universelle du Canal Maritime de Suez) came into being on December 15, 1858. The excavation of the canal took nearly eleven years, mostly through the forced labor of Egyptians workers — a form of labor which was not unique to the French, nor the British before them, but had been in use in Egypt for millennia, since the construction of the pyramids. It is estimated that during the decade of work, over 30,000 people were forced to work on the canal. The British, willing to stop the French project at any cost, sent armed bedouins to start a revolt among workers. Involuntary labor ceased on the project, and shortly thereafter, the Viceroy condemned the slavery and the project was stopped The British government officially condemned the forced work. The British Empire's power increased during the American Civil War and it was the first global naval force. The British recognized the canal as an important trade route and the French project was perceived as a direct menace to their geopolitical and financial interests. Angered by the British opportunism, de Lesseps sent a letter to the British government remarking on the British lack of remorse only a few years earlier when 80,000 Egyptian forced workers died in similar conditions in order to build the British railtrack in Egypt. Although numerous technical, political (due to the British rivalry), and financial problems were overcome, the final cost was more than double the original estimate. The canal opened to traffic on November 17, 1869. The canal had an immediate and dramatic effect on world trade. Combined with the completion of the American Transcontinental Railroad six months earlier, the entire world could be circled in record time. It played an important role in increasing European penetration and colonization of Africa. External debts forced Said Pasha's successor, Isma'il Pasha, to sell his country's share in the canal for £4,000,000 to the United Kingdom in 1875, but France still remained as the majority shareholder. 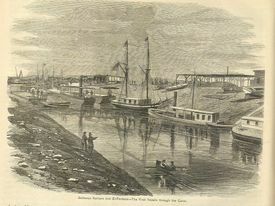 The Convention of Constantinople in 1888 declared the canal a neutral zone under the protection of the British; British troops had moved in to protect it during a civil war in Egypt in 1882. Under the Anglo-Egyptian Treaty of 1936, the United Kingdom insisted on retaining control over the canal. In 1951, Egypt repudiated the treaty, and by 1954 the United Kingdom had agreed to pull out. After the United Kingdom and the United States withdrew their pledge to support the construction of the Aswan Dam, Egyptian President Gamal Abdel Nasser nationalized the Canal in 1956, intending to finance the dam project using revenue from the Canal. This provoked the week-long Suez Crisis, in which a military alliance between the United Kingdom, France, and Israel invaded Egypt. The threat of intervention on behalf of Egypt by the Soviet Union and pressure from the United States ended the crisis. As a result of damage and sunken ships, the canal was closed until April 1957, when it had been cleared with UN assistance. A United Nations force ( UNEF) was established to maintain the neutrality of the canal and the Sinai Peninsula. After the Six Day War in 1967, the canal was closed until June 5, 1975. In 1973, during the Yom Kippur War, the canal was the scene of a major crossing by the Egyptian army into Israeli-controlled Sinai; later, the Israeli army crossed the canal westward. The canal has no locks due to the flatness of the terrain it passes through, and sea level at both ends being the same. The canal allows the passage of ships of up to some 150,000 tons displacement, with cargo. It permits ships of up to 16 m (53 ft) draft to pass, and improvements are planned to increase this to 22 m (72 ft) by 2010 to allow supertanker passage. Presently, supertankers can offload part of their cargo onto a canal-owned boat and reload at the other end of the canal. There is one shipping lane with several passing areas. Three convoys transit the canal on a typical day, two southbound and one northbound. The first southbound convoy enters the canal in the early morning hours and proceeds to the Great Bitter Lake, where the ships anchor out of the fairway and await the passage of the northbound convoy. 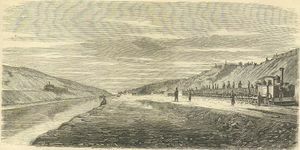 The northbound convoy passes the second southbound convoy, which moors to the canal bank in a by-pass, in the vicinity of El Qantara. 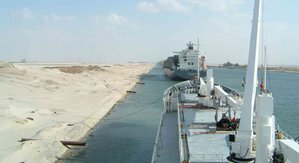 Egypt's Suez Canal Authority (SCA) reported that in 2003 17,224 ships passed through the canal. The canal averages about 8% of the world shipping traffic. The passage takes between 11 and 16 hours at a speed of around 8 knots. The low speed helps prevent erosion of the canal banks by ship's wakes. In El Qantara there is a high-level fixed road bridge. The Arabic al qantara means "the bridge". The Suez Canal Bridge—or the Egyptian-Japanese Friendship Bridge, as it is known—has a 70-meter clearance over the canal and was built with assistance from the Japanese government. In 2001 the El Ferdan Railway Bridge 20 km north of Ismailia was completed: the longest swing span bridge in the world, with a span of 340 m (1100 ft). The previous bridge was destroyed in 1967 during the Arab-Israeli conflict. South of the Great Bitter Lake is the Ahmed Hamdi Tunnel, built in 1983. Because of leakage problems, in the period 1992–1995 a new water-tight tunnel was built inside the old one. Since 1999 a powerline has crossed it. Suez Canal, seen from Earth orbit, courtesy of NASA. Circa 1799 — Napoleon I of France conquered Egypt and ordered a feasibility analysis. This reported a supposed 10 metre difference in sea levels, and a high estimated cost, so the project was set on standby. Circa 1840 — A second survey demonstrated that the first one was erroneous; a direct link between the Mediterranean Sea and the Red Sea would be possible and would not be as expensive as expected. Circa 1854 — The French consul in Cairo, Ferdinand Marie de Lesseps, created the "Compagnie Universelle du Canal Maritime de Suez". 25 Apr 1859 — The French were officially allowed to begin the canal construction (Said Pacha acquired 22% of the Suez Canal Company, the rest of the shares were controlled by French private holders). 16 Nov 1869 — The Suez Canal opened; operated and owned by Suez Canal Company. 25 Nov 1875 — Britain became a minority share holder in the Suez Company, acquiring 44% of the Suez Canal Company. The rest of the shares were controlled by French syndicates. 25 Aug 1882 — Britain took control of the canal. 14 Nov 1936 — Suez Canal Zone established, under British control. 13 Jun 1956 — Suez Canal Zone restored to Egypt. 26 Jul 1956 — Egypt nationalized the Suez Canal. 5 Nov 1956 to 22 Dec 1956 — French, British, and Israeli forces occupied the Suez Canal Zone. 22 Dec 1956 — Restored to Egypt. 5 June 1967 to 5 June 1975 — Canal closed and blockaded by Egypt. 10 April 1975 — Suez Canal reopened. 14 Nov 1936 - 24 Jul 1939: ? A popular film, Suez was made in 1938 and starred Tyrone Power as de Lesseps and Loretta Young as a love interest. A sweeping epic, it is very loosely based on history. Suez Canal was recently featured in the video game Battlefield 2142 made by EA Games. The European Union and Pan-Asian forces fight each other for control of the canal after a futuristic ice age.